What causes aggression in cats? Many pet parents have seen it first hand. Your cat may be friendly and affectionate one moment, and then turn aggressive the next. What happened? Here’s a little insight into why a cat may suddenly lash out. Petting can cause a very confusing type of aggression. Your cat seems to be enjoying your attention, yet he or she may suddenly turn and scratch or bite you. Just as bowing to another person symbolizes humility by putting yourself into a vulnerable position, cats show their bellies as a sign of trust. You wouldn’t slap someone in the back of the head when they bow to you, but this is how some cats feel when you touch their belly when they roll over. Similarly, some cats only like to be petted a definite number of times, and some cats only like to be petted on the head or neck. Many cats don’t like to be picked up or turned on their backs. 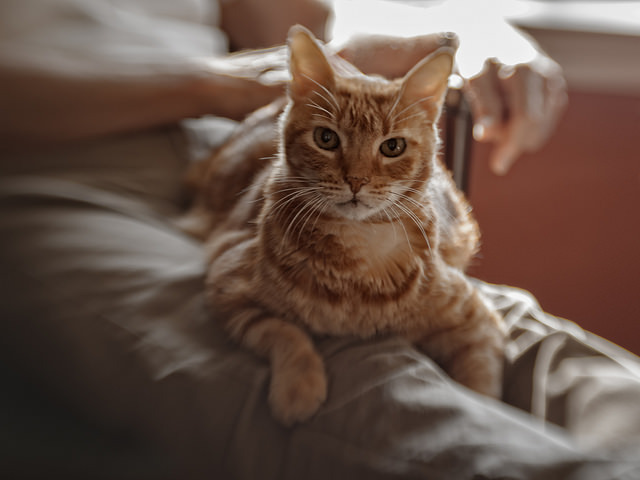 Your best bet is to pay attention close to how your cat is reacting while you pet him or her. Play can also suddenly turn aggressive. You can discourage rough play behavior by bringing new toys that direct the cat’s attention away from your body, like balls or feathers on sticks. Don’t teach your cat to play with your hands or feet. It may be cute as a kitten, but it’s a tough (and painful) habit to break when kitty grows into an adult. Some cats play rough, but play should always be silent. A hissing or growling cat is not playing and should be left alone. Routines keep animals feeling safe and calm. Sometimes, all it takes is rearranging furniture or adding a new housemate to make some cats feel as if their entire worlds have been flipped upside down. Hearing a familiar, calm, and gentle voice can also help to soothe an anxious cat. You can try singing, talking about your day, or reading a book aloud. The sound of your voice will also help your kitty to know where you are in the house. Comfort foods such as treats or canned food for a kitty on a dry diet can also help ease the tension. Some cats like company while eating, but some cats feel safer if you leave the room so that they can eat in peace. Alas, sometimes there a triggers beyond your knowledge or control that may upset your cat. The ASPCA has a more comprehensive website on aggressive behaviors and solutions that may help you find the answer. The most important thing to remember is that if a cat becomes aggressive towards you, give him or her space. If a cat wants to be left alone, it’s important to respect that. “Flash” by Anne Worner is licensed under CC BY-SA 2.0. Enter to win these toys on Instagram and Facebook!